Today Google announced grants for a select group of non-profits that are pursuing ways to use Google Glass and its unique abilities to further their causes. We’re proud to be a friend and partner to one of those select organizations, Mark Morris Dance Group. Mark Morris Dance Group, along with Brooklyn Parkinson Group, runs Dance for PD™, an amazing award-winning program to enable people with Parkinson’s to harness the strategies of professional dancers—helping people regain a sense of control and independence as they go about their daily lives. One challenge they face, however, is bringing learning from the classroom into the real world. That’s where Google Glass comes in. 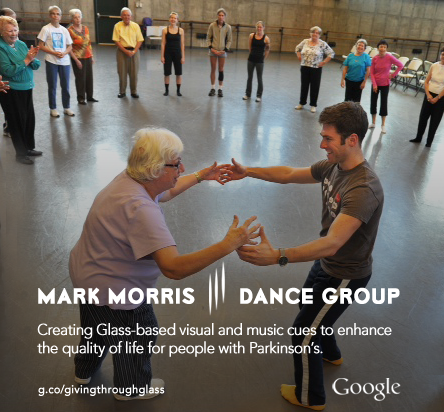 Together with Mark Morris Dance Group and Google, SS+K will be exploring how we can further empower people with Parkinson’s disease by building Moving Through Glass, an application and program made specifically for Google Glass. Moving through Glass will create an intuitive, portable, dance-based toolkit for people living with Parkinson’s disease. We are the beginning of an amazing technological revolution powered by exciting new connected devices. Products like Google Glass and Google Wear bring with them a whole new potential to empower people to live their lives in ways that were never before possible. We hope that by taking advantage of Google Glass sensors and heads-up display, we can help develop significant advancements for people with Parkinson’s. This is just the beginning.